I found this Martian-looking insect, about as big as my thumb, on a milkweed on Kilian Drive today. Approached from above, with its shadow hidden beneath it, the creature blended so neatly with the leaf that I did not notice it at first. It has orange, beady eyes and antennae longer than its body (they extend far out of the picture at right). 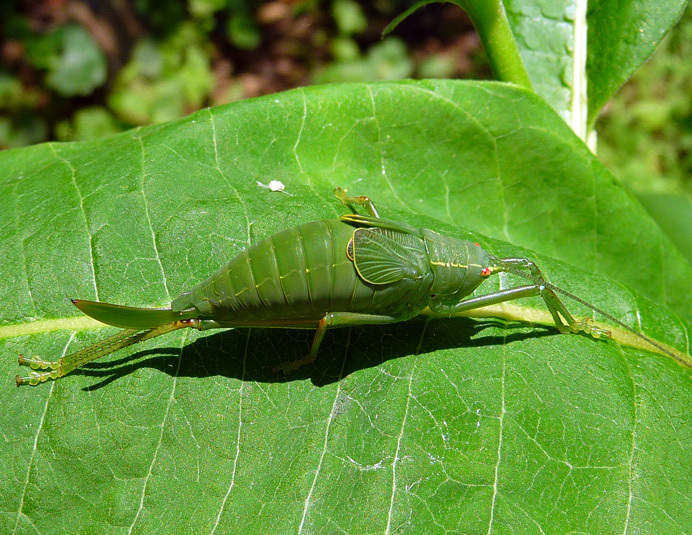 Its wings appear to be useless artifacts of a former instar or some earlier phase in the species' evolution—or perhaps they will grow to support flight. What on earth is this critter? Be the first to and you win a free copy of DietPower for yourself or a friend. .